Come January, the main horticultural activity for many gardeners —myself included— is thumbing through the newly arrived seed catalogues; dreaming of warm summer days and freshly-picked produce from the garden. 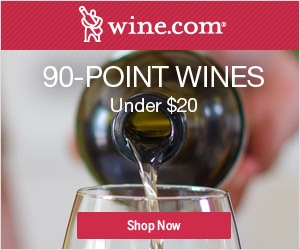 A trip to the supermarket in January —where almost all that is on view in the produce section is vegetables and fruits shipped from far around the globe— leaves me pining for those wonderful varieties selected for their bouquet, taste and texture, rather than varieties that will withstand —on average— a 1,200 mile trip to the display shelf. Many of the finer varieties of produce —grown primarily for epicurean qualities— are difficult to find, or completely unobtainable commercially. The supply of rare fruits and vegetables continues to be maintained by seed-saving enthusiasts, who distribute their treasures at swaps or passionately give them away. With this in mind, I always save seed from some of the vegetables I grow. Most of my collected seeds will be for personal use. 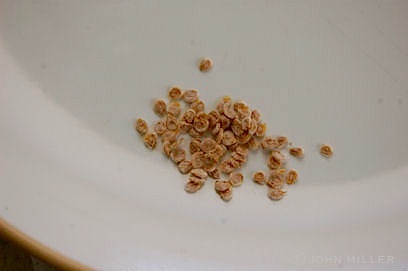 Why pay a seed company 65 cents a seed for a tomato seed —yes, I did pay that price for a rare tomato seed this year— when I can save 100s for myself with just a few minutels work, and the excess I can perhaps swap with someone who has another rare variety which I would like to grow? There is also the huge satisfaction —with no fiduciary benefit— of completing the circle from seed to harvest and back to seed again. If providing an entire meal at this time of year with vegetables grown less than 100 feet from my back door, then how much more local —my passion for 30 years— it is to use vegetables where the seed never came from more than 100 feet away! My definition of an ideal summer is to make ratatouille with completely home grown vegetables, adding only Cabot cheese and olive oil from afar. In western society, there exists almost a mystique about promulgating life; whether it be human, other animal or plant. With plants, the work is almost unquestioningly left to ‘experts’, even though the processes are natural and have gone on since time immemorial. I would be the first to admit that experts do indeed serve purpose: I use F1 hybrids to suit (see my previous post on semi-leafless peas) and I know I am alive thanks to the National Health Service in the UK. But when it comes to indulging in the incredible diversity of vegetables available, backyard seed-savers also deserve due recognition. 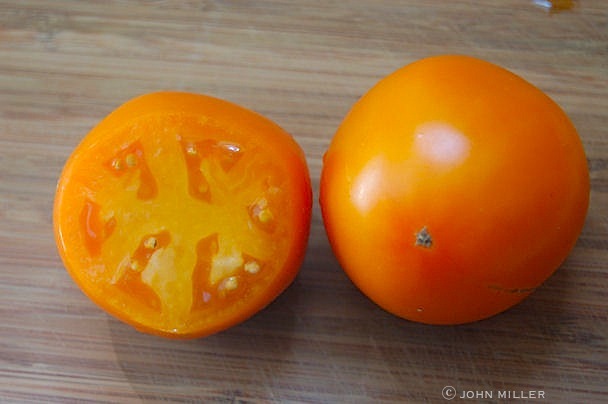 When I look at my slowly ripening ‘Evergreen’ tomatoes —with all the splits and cat-facing— I know I will never see them on shelves of even the most taste-discriminating store. But what flavor I would miss if I didn’t grow them just for myself and save some seed, just in case they become unavailable. 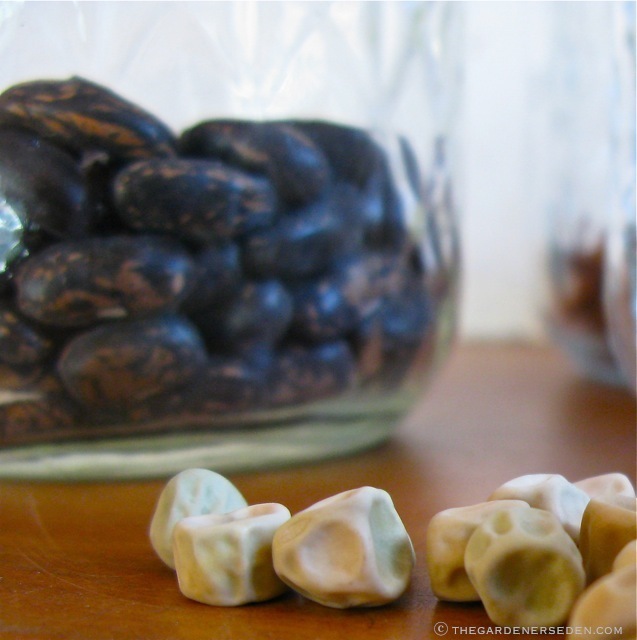 Saving the seed from any heirloom vegetable is easy. 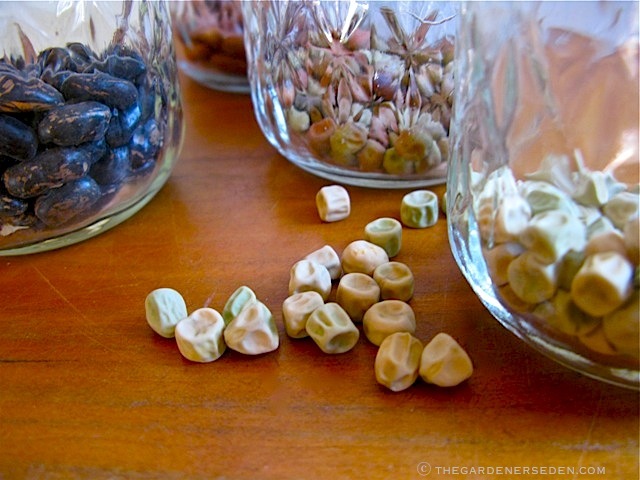 If you have a favorite variety, or even just want to try seed saving for the fun of it, take a few minutes to learn about the process and give it a go. You may even want to take the procedure a step further and develop a totally new variety! Heirloom Radish ‘Il Candela di Fuoco’. Above photo showing immature pod, mature pod and a split pod with seed. Thank you John, for your contributions to The Gardener’s Eden! In addition to operating The Old School House Plantery, the Millers also grow and sell gourmet produce, including many heirloom vegetables. The Miller’s produce may be found in Vermont at The Brattleboro Farmers Market. Many of us learn about the basic principles of seed saving in grade school. Kids are usually taught how to collect seed by drying and picking apart enormous sunflowers, shiny cobs of corn, or by threshing pods filled with colorful beans. These are all wonderful, hands-on projects for children, which teach practical, sustainable, real-world lessons. But as adults with busy lives, we often lose touch with many of the simple processes of nature. 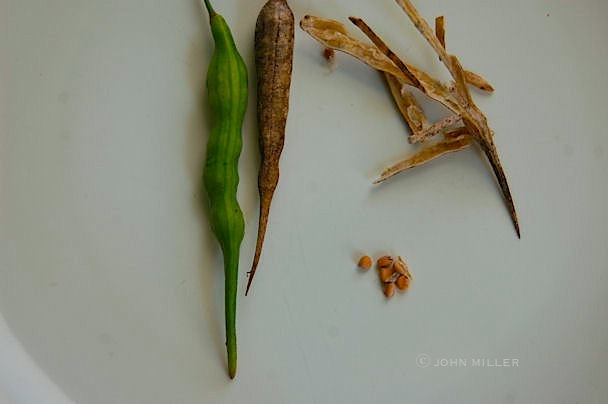 There’s nothing complicated about saving seed, but if you’ve never tried it —or if it’s been two or more decades since your last experiments— you may want to read up on the subject, or refresh your memory a bit before starting. Many seeds can be saved by simply drying, threshing, separating and storing them in a sealed jar in a freezer or refrigerator, or in a dry, cool and dark place in envelopes, bags or jars. 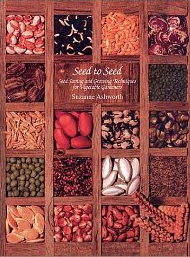 Some easy seeds to begin with include all of those mentioned above, plus squash, pumpkin, melon, pepper and peas. Other seeds, such as tomato and cucumber, are most successfully saved using a wet-method (seeds are scraped with a spoon into loosely covered jars, where they are stirred for a few days – then rinsed of pulp, strained and dried for several more days on paper towels). Curious to learn more about the process of saving seed? There are some excellent resources for gardeners both in print and online. 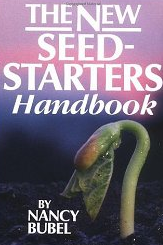 Two of my favorite books on the subject, Seed to Seed: Seed Saving and Growing Techniques for Vegetable Gardeners, by Suzanne Ashworth & Kent Whealy and The New Seed Starter’s Handbook by Nancy Bubel (both pictured and linked below) cover the basics for those just starting to learn about seed collecting. 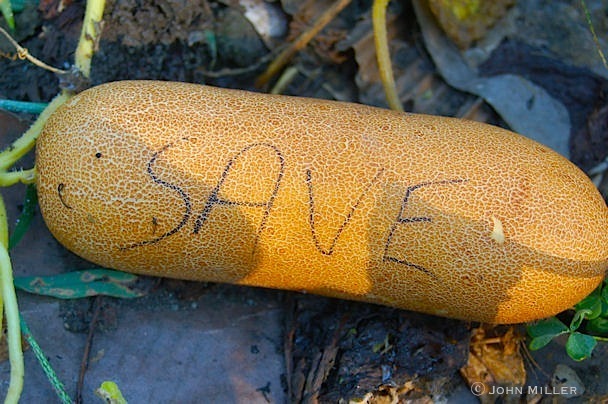 Great online resources include the fantastic Seed Savers Exchange, which in addition to providing information about how and when to collect and save seed, also publishes wonderful blog-articles like this one on planning your garden for seed saving (click here). The Seed Saver’s Exchange is a non-profit which began in 1975, collecting and selling an enormous variety of heirloom seed through their wonderful catalogue (which you can download from the site). Another good resource is the non-profit Organic Seed Alliance, which has an abundance of free and useful information, including downloadable seed-saving publications and instructions, available online. 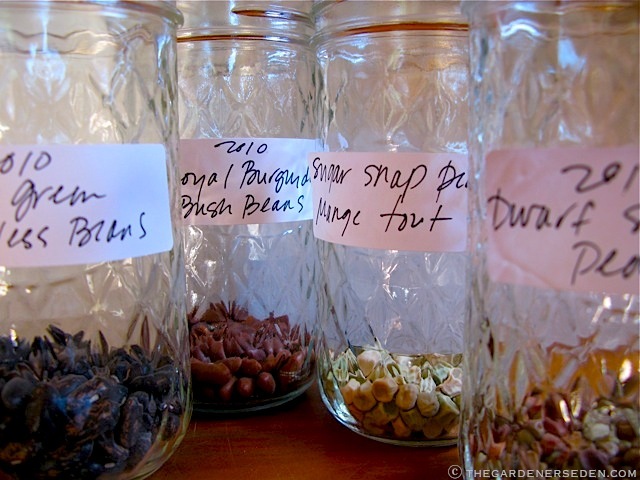 I also enjoy the useful and free International Seed Saving Institute, which has a handy, detailed list of how to save seeds organized by plant. A very useful chart for seed saving is available online, free of charge, from Fedco Seeds here. You are currently browsing entries tagged with Seed Saving Resources and Links for Gardeners both New and Old at The Gardener's Eden.